Leo is frustrated with how his 4th grade classes teach for Martin Luther King Day. “We never learn about all the other people who’ve struggled against racism. 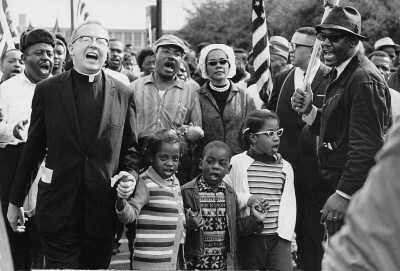 And they always talk about how he was peaceful and nonviolent all the time, which I don’t agree with.” So I tell him Martin Luther King stood for a lot more than just civil rights, and the 1960s black freedom movement included lots of different people, who had a lot of different ideas about nonviolent action and other things. I read him excerpts from teacher Craig Gordon’s essay, “There’s infinitely more to Martin Luther King, Jr. than ‘I have a dream. '” I show him video clips of Michael Ealy reading King’s “Beyond Vietnam” speech and King himself speaking in solidarity with striking sanitation workers in Memphis the day before he died. I talk about how, toward the end of his life, King moved from a focus on racial injustice to a critique of economic injustice and capitalism. To get beyond the lone hero version of the civil rights movement, we watch a short documentary about the Student Nonviolent Coordinating Committee, or SNCC (made, appropriately, by students), which rightly puts the great organizer Ella Baker front and center. At our local public library, we check out the book Freedom Rides: Journey for Justice by James Haskins, which is written for older children and covers civil rights struggles from the 19th century to the rise of Black Power in 1966. I talk about how the 1960s black freedom movement was a driving force that inspired lots of other social justice struggles, like the women’s movement; gay and lesbian movement; Chicano, Puerto Rican, Asian American, American Indian movements; even the ecology movement. Leo is not a pacifist, but he understands that nonviolent resistance in the face of racist mobs and cops is a powerful act of bravery. We watch an intense scene from the Danny Glover film Freedom Song, a SNCC nonviolence training role play in which Mississippi civil rights workers are subjected to some of the invective and abuse they would face at sit-ins. For a different perspective, we also watch clips of Malcolm X speaking about self defense (“we’re nonviolent with people who are nonviolent with us”) and part of a documentary about the Deacons for Defense, who in the mid 1960s Deep South defended civil rights workers (including Dr. King) with guns. It’s not enough, not nearly enough to do justice to this complex history. But it’s a start. Abernathy family photos, public domain, available via Wikimedia Commons.